When news broke in 2012 that Brian K. Vaughan was returning to comics, readers had every reason to be excited. Vaughan is, after all, the writer of books like Y: The Last Man, Runaways, and Pride of Baghdad. The news that he’d be coming back, on a quirky sci-fi title, no less, meant that Saga had a lot of eyes on it from the start. Thankfully for all of us, the series exceeded, and continues to exceed expectations. 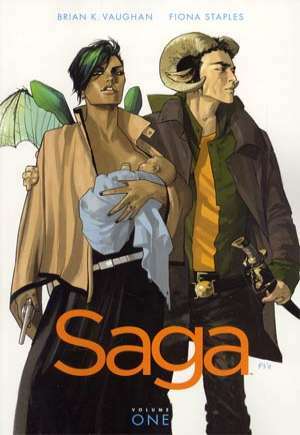 The best way I’ve ever been able to describe Saga to someone who doesn’t read comic books is: “Imagine if Star Wars was done by HBO, with little pieces of Game of Thrones, Lord of the Rings, Ghostbusters tossed in, with maybe a pinch of Baby Boom (You know, that Diane Keaton movie? ).” But admittedly, that doesn’t quite cover it. Vaughan and Fiona Staples have succeeded in creating a universe all their own, complete with characters that look very different, but feel very similar. When we open the book, Alana, a winged humanoid from the planet Landfall, is giving birth to her daughter Hazel. At her side is Marko, a horned humanoid from Landfall’s moon, Wreath. Landfall and Wreath have been at war for ages, and thus Marko and Alana having a child together is controversial to say the very least. The book follows these fugitive parents and their infant daughter as they desperately search for refuge from a universe that seems hell bent on destroying their new family. By far the best thing Saga has going for it is the relatability of its characters. This is evident right from the start. We meet Marko and Alana in a moment of extreme vulnerability and self consciousness. She’s giving birth, and is worried about, of all things, defecating (“Am I shitting? 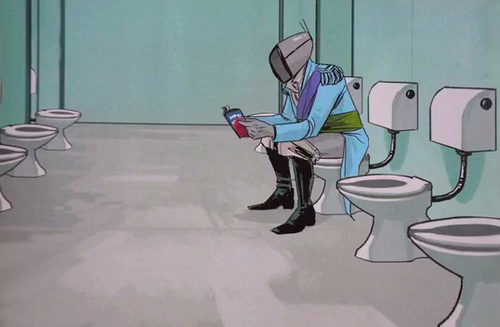 It feels like I’m shitting!”). Then, mere moments after Hazel is born, they’re attacked and on the run. We very quickly get a sense of their chemistry, their love for one another, and their desperation to save this helpless newborn child. We’re able to invest in these characters very quickly because they feel very familiar, despite being as otherworldly as they are. – The Will, a “freelancer,” or essentially a bounty hunter, who’s tasked with finding Marko and Alana. As it turns out he’s a hunter with a heart. We see that when he saves a child from a life of indentured sexual servitude. He also has a cat that can tell when people are lying. That’s pretty cool. – Izabel, the disemboweled full torso ghost of a somewhat simian looking teenage girl who babysits Hazel. Get the point? The familiarity of these characters makes Saga an easy series to fall into, even though it’s set in a universe we know very little about. Indeed, as obviously important as Vaughan’s writing and characters are, Staples is ultimately the star of Saga. It’s tough to imagine all this amazingly creative imagery coming from a single mind. From the character designs, to the clothing, to the environments and planets, it’s all her. 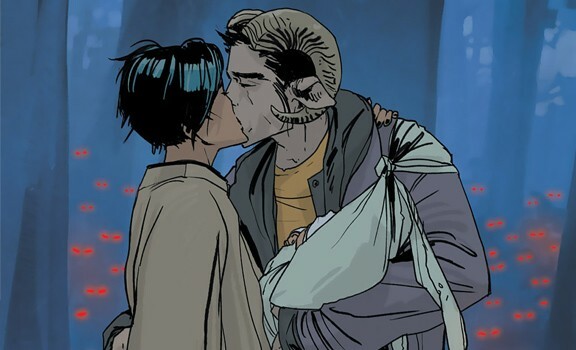 The true formula to Saga’s success is Vaughan’s familiar writing, combined with Staples being allowed to simply be Fiona Staples, and do her thing. Part of the fun of every issue in this collection is that it feels like our artist’s creativity has allowed to flow freely and of its own accord. We’re literally visiting Fiona’s world. Saga, Vol. 1 is a tough book to throw stones at. The characters are fun, the art is spectacular, and you’re consistently engaged in the story. It has its share of dirty, screwball humor. But sometimes that’s part of the fun. There’s so much talent on display in these pages, it’s tough not to enjoy it. 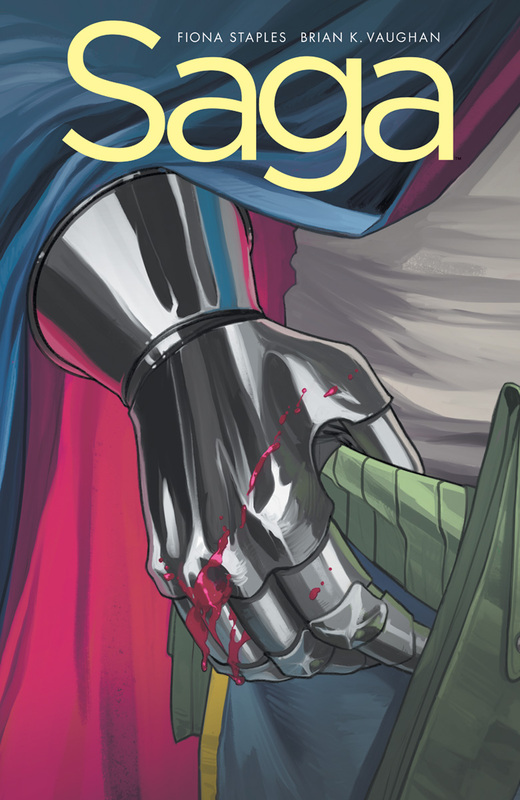 As for me personally, Saga, Vol. 1 is one of the books I point non-comic book readers to when they ask for a starting point. And I know I’m not the only one. I imagine it’d be tough for a book to aim for a compliment higher than that. Image 1 from davescomicsuk.blogspot.com. Image 2 from superheroreviews.blogspot.com. Image 3 from panels.net. This entry was posted in Comic Books/Graphic Novels and tagged Brian K. Vaughan, comic books, Fiona Staples, Image Comics, Prince Robot IV, Rob Siebert, Saga (Image Comics), Saga Vol. 1, trade paperback reviews on 10/30/2012 by primaryignition.